As much as we all hate a traffic jam, you gotta love the static mind for inspiration! You know the kind of head space you get whilst in the shower? Empty… with SO much room for yummy ideas to come through. I tend to get the same openness and quality of inspiration when I’m stuck in traffic, which in London, is pretty often! So today as I’m painfully navigating my way from central London back to North London (about 8 miles which in rush hour can take 90 minutes no joke), I received a Universal lesson that was so cute and relevant, I had to share! I was stuck in traffic on a road which meant that at one point I had to squeeze between a parked car and a stationary van coming from the opposite direction. He was stuck out like a sore thumb, stubbornly trying to push his way past something I couldn’t see. Naturally I became irritated and in true Taurus style, tried to squeeze my mahoosive Range Rover through this tiny gap. Round peg square hole springs to mind right?! My only choice at this point was to scowl at my wing mirror in the hope that my car would suddenly lose a little bit of weight and miraculously fit through the gap. <—- This is what I call the antithesis of the ‘surrender’ lesson I prattle on about so much! Then, very unexpectedly… the van driver pulled his vehicle over a little to allow more room for me to get through… problem solved… but before moving another inch, I giggled (at my own stupidity), and thanked him through the window. 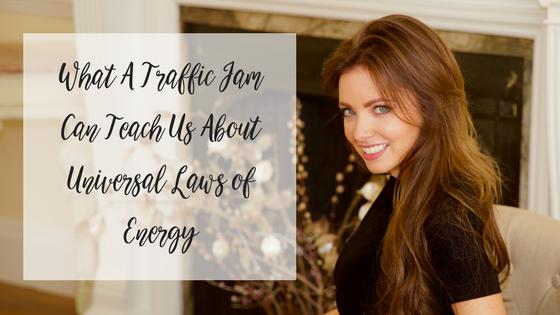 So what the ‘eff does this have to do with the Universal Laws of Energy?! This two minute encounter reminded me of one of the most fundamental rules of energetic flow, which at that moment I had completely forgotten. And as with all Universal messages and assignments, it came at the perfect time for me. When in times of struggle or frustration, the responsibility is NOT on you to force the desired result. Relying on yourself only creates more resistance. Restrictive energy blocks flow. Instead, simply ask for what you need, and be open to receiving. It is OK for others to move to allow your flow to come through. It is OK for the Universe to open the flow again for you. It is OK to completely rely on Universe for results and answers. It is OK to expect miracles. The reason I giggled at myself was because it never even occurred to me to ask the van driver to move a little so I could get through. He was right there in front of me, at eye level, willing and ready to move to allow me to pass, and IT NEVER OCCURRED TO ME TO ASK!! I honestly think this is where most of us trip up on our cosmic ordering, on living the Law of Attraction, and on living in flow. We just forget to ask! Something crops up that seems to block the long term goal, so instead of asking the block to be removed and creating a temporary short term goal that can easily be met… we get cross, frustrated, deflated, disenchanted… and then sometimes we give up! So next time you’re in a pickle, ask for help, ask for guidance, ask for the removal of the block, turn to friends, family, me, your coach… the Universe is in all of us, including you, all you have to do is ask!